All LVL0 parts have to be stored in plasmids to allow for amplification and long term storage. To create new LVL0 parts, a PCR product or annealed oligos are cloned into a part entry vector. This vector harbours the resistance and ori that are required for selection and propagation. Furthermore, part entry vectors can be designed in a way that they contain a dropout. This dropout can be a transcription unit for a marker that generates a visible output. The first golden-gate-based toolbox MoClo (Weber et al. 2011.) used a LacZ alpha transcription unit which can be used for blue white screening in many E. coli cloning strains. 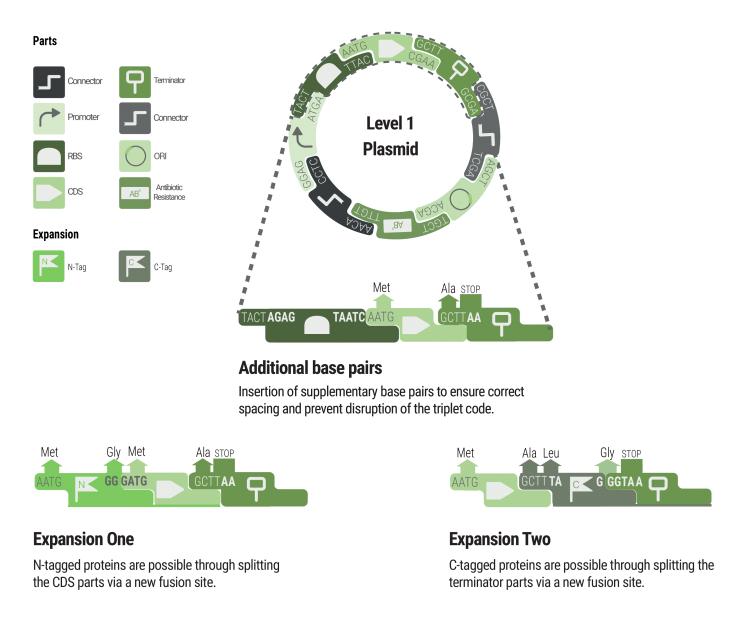 This concept was also adapted by iGEMs PhytoBrick system. During the cloning of LVL0 parts, this dropout is replaced by the desired part. When the cloning reaction is transformed into a suitable E. coli strain and the cells are plated on agar plates with supplemented IPTG and X-Gal. Colonies transformed with the religated entry plasmid appear blue while white colonies most probably contain the correctly assembled plasmid. The LVL0 part entry vector in iGEMs PhytoBrick system (BBa_P10500) has been designed as described and can be used for blue white screening. We appreciate the approach of using part entry plasmids with dropouts but, for two reasons, we think that LacZ is not an optimal reporter. First, blue white screening requires the two expensive chemicals IPTG and X-Gal which have to be added to the agar plates. Second, blue white screening is restricted to E.coli strains with an incomplete lac operon that is complemented by the LacZ alpha fragment that is expressed from the plasmid (Langley et al. 1975.) . Consequently blue white screening is not compatible with a V. natriegens wild type strain (Link zu Improvement Page). iGEM provides the universal acceptor plasmid BBa_P10500 for creating new PhytoBricks. This plasmid contained the lacZ-α part in the cloning sites for blue-white screening. As we wanted to establish Vibrio natriegens as a chassis for cloning, we investigated if the wild type strain is compatible with blue-white screening. Unfortunately, cloning using BBa_P10500 in V. natriegens shows no difference between colonies containing the lacZ-α dropout and those without. To overcome this limitation and to enable fast and reliable cloning with V. natriegens, we decided to establish a new visualization method. Our improved part is a derivative of the iGEM BBa_P10500 containing a sfGFP dropout as fluorescent selection marker. 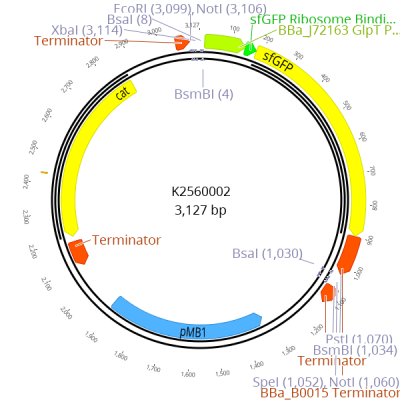 Our improved part BBa_K2560002 is a derivate of the BBa_P10500 containing sfGFP drop out. In the pictures 2, you can see the wild type V. natriegens in comparison with the iGEM BBa_P10500 forming white colonies as well as bright green colonies containing the improved part BBa_K2560002. No differences between the wild type and the BBa_P10500 containing colonies are noticable. On the contrary, our new BBa_K2560002 part leads to a strong visual distinction to colonies which do not possess the sfGFP. In this way, we created a part for universal LVL0 cloning with a improved selection without the need of additional supplements like Xgal or IPTG. Our part not only suits for V. natriegens but is convenient for the frequently used cloning host E. coli. As it can be seen in the picture 3, E. coli containing the sfGFP possess a considerable strong green colour even without the use of UV light and is just or even more distinguishable from the wild type as the lacZ containing blue colonies. By using our improved part BBa_K2560002 instead of the iGEM part BBa_P10500 work and money for the addition of the required supplements can be saved and the risk of not functional plates for selection is decreased. In our experiments, we were using 40 μg per Liter Xgal and 0,5 mM IPTG. Calculating with current prices, 100 plates supplemented with Xgal and IPTG costs about 80 dollar. By using our improved part for cloning, the detection of successfully ligated clones from non is feasible for strains which are not compatible with blue-white screening and therefor becomes more universal, faster and cheaper than before. Figure 2: Hierarchical cloning is facilitated by subsequent Golden Gate reactions. Figure 3: Additional bases and fusion sites ensure correct spacing and allow tags.